^ Young, Barbara. Wheater's Functional Histology: A Text and Colour Atlas 5th. Elsevier Health Sciences. 2006: 359 [2013-11-09]. ISBN 9780443068508. ^ Chaudhuri, S.K. Natural Methods of Contraception. Practice of Fertility Control: A Comprehensive Manual, 7/e. Elsevier India. 2007: 49 [2013-11-09]. ISBN 9788131211502. ^ Allen, Denise. Managing Motherhood, Managing Risk: Fertility and Danger in West Central Tanzania. University of Michigan Press. 2004: 132–133 [2013-11-09]. ISBN 9780472030279. ^ Rosenthal, Martha. Human Sexuality: From Cells to Society. Cengage Learning. 2012: 322 [2013-11-09]. ISBN 9780618755714. ^ Nichter, Mark; Nichter, Mimi. Cultural Notions of Fertility in South Asia and Their Influence on Sri Lankan Family Planning Practices. (编) Nichter, Mark; Nichter, Mimi. Anthropology & International Health: South Asian Case Studies. Psychology Press. 1996: 8–11 [2013-11-09]. ISBN 9782884491716. ^ Wilcox AJ, Baird DD, Weinberg CR. Time of implantation of the Conceptus and loss of pregnancy. New England Journal of Medicine. 1999, 340 (23): 1796–1799. PMID 10362823. doi:10.1056/NEJM199906103402304. ^ Littleton, Lynna A. & Engebretson, Joan C. Maternity Nursing Care. Cengage Learning. : 195 [2013-11-09]. ISBN 9781401811921. ^ Gupta, Ramesh C. Reproductive and Developmental Toxicology. Academic Press. 2011: 22 [2013-11-09]. ISBN 9780123820334. ^ Watson, Stephanie & Stacy, Kelli Miller. The Endocrine System. (编) McDowell, Julie. Encyclopedia of Human Body Systems. Greenwood. 2010: 201–202 [2013-11-09]. ISBN 9780313391750. 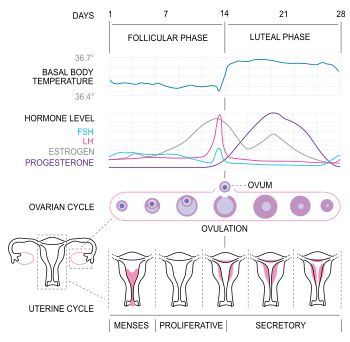 ^ Navarrete-Palacios E, Hudson R, Reyes-Guerrero G, Guevara-Guzmán R. Lower olfactory threshold during the ovulatory phase of the menstrual cycle. Biol Psychol. July 2003, 63 (3): 269–79. PMID 12853171. doi:10.1016/S0301-0511(03)00076-0. ^ Beckmann, Charles R.B. (编). Obstetrics and Gynecology. Lippincott Williams & Wilkins. 2010: 306–307 [2013-11-09]. ISBN 9780781788076. ^ Roberts S, Havlicek J, Flegr J, Hruskova M, Little A, Jones B, Perrett D, Petrie M. Female facial attractiveness increases during the fertile phase of the menstrual cycle. Proc Biol Sci. August 2004, 271 (Suppl 5:S): 270–2. PMC 1810066. PMID 15503991. doi:10.1098/rsbl.2004.0174. ^ article in BBC News. BBC. 2008-06-12. ^ Page 54 in: Guillebaud, John; Enda McVeigh; Roy Homburg. Oxford handbook of reproductive medicine and family planning. Oxford [Oxfordshire]: Oxford University Press. 2008. ISBN 0-19-920380-6. ^ Health and fertility in World Health Organization group 2 anovulatory women. Human Reproduction Update. 2012, 18 (5): 586–599. PMID 22611175. doi:10.1093/humupd/dms019.